Membrane composition of molybdate-selective electrodes based on higher quaternary ammonium salts has been optimized. It is found that the best analytical characteristics of electrodes are based on 3,4,5-tris-dodecyloxybenzyl) tetraoxyethyltrimethyl ammonium in chloride form (5% w/w) with the addition in membranes of the solvating additive (neutral carrier) – p-heptyl ester 4-trifluoroacetylbenzoic acid (TFABAHE, 20% w/w). Their analytical characteristics: low detection limits (1·10-6mol/l); logarithm selectivity coefficients relative to interfering chloride -1,-4, sulfate -0.8, bromide -0.7, tungstate -0.9 ions; working range of pH (8.5–9.5); slope of the electrode function (24.4 mV/decade) are determined. Sodium molybdate aqueous solutions has been studied with FT-IR spectrometry method at various pH. In sodium molybdate solutions at pH greater than 8.0–8.5 hydrolytic processes are mild. However, using a molybdate-selective electrodes is better to use freshly prepared solutions. This increases the reproducibility of the experimental results. The proposed electrode was employed to determine of molybdate ions of model water samples using the calibration plot method. Keywords: Molybdate-Selective Electrode; Quaternary Ammonium Salt; p-heptyl Ester 4-trifluoroacetylbenzoic Acid. Metallic molybdenum is widely used in the lighting industry, biological catalysis, ferrous and non-ferrous metallurgy, glass manufacturing, high temperature furnaces and equipment, aerospace applications et. al. In this regard, the content of molybdenum compounds increases in industrial emissions, waste waters and natural objects. According to the World Health Organization molybdenum content in drinking water is 0.07 mg/l. The content of molybdenum (VI) in plants varies greatly. Of all the essential trace elements required for the growth of higher plants, Mo is required in the least amount, and leaf of molybdenum (VI) contents of 0.1–0.5 mg/kg are typically considered adequate. Molybdenum is present in the lithosphere at average levels up to 2–3mg/kg but can increase in concentration (300mg/kg) in shales that contain significant organic matter . Molybdenum is an expensive metal. Its compounds in higher oxidation state (VI) are toxic (maximum allowable concentration in reservoirs is standardized at 0.5 mg/l). Timely and reliable control over the content of molybdenum (VI) in waste electrolytes and natural objects is an important economic and environmental problem . Most often thiocyanate photometric method is used for determination of molybdenum (VI) . However, it is not suitable for determining molybdenum in the presence of colored ions, tungstate ions (VI). This method involves carrying out additional operations (separation, masking), which are characterized by the increasing complexity of techniques, slowing of analysis. 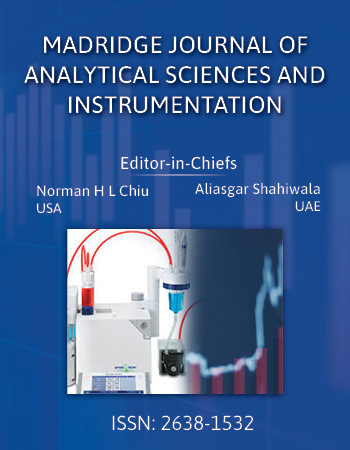 Physical and chemical methods, which are characterized by high sensitivity, less frequently used, because they long time (neutron activation analysis), or the road due to the used equipment (atomic absorptionspectrometry, atomic emission spectrometry inductively coupled plasma-atomic emission spectrometry, flowinjection analysis) and consumables. These methods usually involve complicated methodology, pretreatment of samples. Their use in small laboratories economically unjustified [4,5]. A technique which permits rapid, accurate and low cost analysis is the ideal choice and such a situation is met to a great extent by ion sensors. These sensors offer several advantages over other analytical techniques particularly in regard to speed, simplicity and cost of operating systems. Thus, these sensors allow a wide range of environmental pollutants to be detected and quantified rapidly, sensitively and selectively . Known that the condition of the molybdenum compounds in the solution is relatively complicated, i.e. the formation of various polycompounds, it making difficult for the potentiometric determination of MoO42- ions [6,7]. In table 1 presents a brief characteristic of MoO42-–SEs. The proposed electrodes has been used to measure molybdenum in ore samples and corrosion inhibitor samples [4,8].The sensors [4,9] are used in non-aqueous medium. However, in the above papers [4,8-10] does not provide information on the impact of state molybdenum (VI) in aqueous solution to work of ISEs. In addition, the working range pHofISEs (5.0–7.0; 5.4–10.5; 5.8–10.9; 6–10) some doubt as acidic environment promotes hydrolytic and polycondensation processes in molybdate containsolutions. The selectivity of MoO42-–SEs in some cases is not high enoughin the presence of interfering tungstate, sulfate etc. ions. In works [4,9] has been described the use of ISEs for determination of molybdenum in the non-aqueous solutions, that creates additional difficulties and requires the use of toxic substances (methanol). Higher quaternary ammonium salts (QAS) proved themselves as promising materials for making anion selective ISEs [11-13]. One of their characteristic features has been believed to be their low extraction capacity toward hydrophilic double charged anions (sulfate, selenate, selenite, carbonate etc.) [14, 15] explained by strong hydration of the latter, as well as steric hindrance by QAS long hydrocarbon chains preventing simultaneous approach of two QAS cations to the double charged anion. The above is true, however, only for QAS cations having all four long-chain (no shorter t han C3) hydrocarbon substituents at the nitrogen atom. Therefore, it is interesting to test some new QASes with the sterically accessible exchange center against double charged anions. In addition, the most spectacular successes in developing the ion-selective electrodes with improved selectivity have been connected with synthesis and use of neutral anion carriers such as 4-trifluoroacetylbenzoic acid heptyl ester (TFABAHE). The goal of this work is to develop the new molybdate selective electrode of high analytical performance based on higher QAS and TFABAHE additive. The 3,4,5-trisdodecyloxybenzyl(oxyethyl)n trimethylammonium chloride ((oxyethyl)nTM), where n = 2–4) and 4-(3,4-bishexadecyloxyphenyl) butyl trimethylammonium bromide (BHPBTM) ion exchangers with high steric accessibility of the exchange center used for the first time in developed this sensor. For ISE membranes preparation the following reagents were used (Figure 1): poly(vinylchloride) (PVC, Fluka AG Selectrofore®); (oxyethyl)nTM; BHPBTM; trinonyloctadecylammonium iodide (TNODA), 3,4,5-tris-dodecyloxybenzyltributylammonium bromide (TB), 3,4,5-tris-dodecyloxybenzyltriethyl ammonium bromide (TE) and 3,4,5-tris-dodecyloxybenzyltrimethylammonium bromide (TM), TFABAHE– neutral carrier, dibutylphthalate (DBP, Sigma-Aldrich) – plasticizer, tetrahydrofuran (THF) – solvent. Quaternary ammonium salts in bromide or chloride forms with an amine content of less than 0.03% were preparedin theDepartment of AnalyticalChemistry of BSU as described in . All reagents of salts (sodium molybdate Na2MoO4·2H2O, sodium tungstate Na2WO4·2H2O, potassium chloride KCl, potassium sulfate K2SO4, potassium bromideKBr, potassium nitrate KNO3), ammonia aqueous solution and sodium hydroxide (NaOH) were of analytical or puriss grade. All solutions were prepared using distilled water. Membranes ofISEs contained 33 wt.% PVC, 20 wt.%TFABAHE, 5 wt.% QAS and 42 wt.% DBF. Membranes were prepared by the following procedure: QAS, PVC, DBF, neutral carrier (TFABAHE) were weighed in a glass weighing bottle and were stirred for 5 min. Freshly distilled THF was added to a mixture and stirred on a magnetic stirrer for 2 h. The solution was poured on a smooth glass plate. To prevent solution spreading the teflon circular cylinder was placed on the glass plate. The plate was covered with a sheet of filter paper and then was left in a fume hood for 20–24 h to complete THF evaporation. Disc-shaped membranes were cut from the obtained elastic film and stuck to the electrode end of PVC body, using THF-PVC composition as an adhesive. The thickness of the membrane film was about 0.5–0.6 mm. In reference  we studied the effect of the solvating additive content on the analytical characteristics of ISE reversible to doubly charged inorganic ions. The optimum content of the solvating agent is 20% w/w. HTFAB reacts with QAS in oxygen anionic forms strong anionic solvates various structures with high formation constants, which leads to an increase of exchange constants of these anions for the a hydrophobic, e.g., chlorides, bromide, oxalate, tungstate and improved selectivity MoO42--SE for MoO42- ions in the presence of its ions. Solution containing 1·10-3mol/lNa2MoO4 or Na2WO4 and 1·10-3mol/lКСl was poured inside the electrodes. The electrodes were soaked in 0.1 mol/lNa2MoO4 or Na2WO4 solutions for 24–36 h.
Na2MoO4 or Na2WO4 solutions with concentrations from 10-8 to 10-3 mol/l were prepared by serial dilution of 1·10-2 mol/l solutions. Potential measurement and pH control of the solutions were performed using digital I-160.1MP ion meter (Republic of Belarus, Gomel Plant of Measuring Devices). Silver chloride electrode EVL-1M3 with internal 0.1 mol/l KCl solution was used as a reference electrode. For pH determination was used glass electrode EGL-1M. Calibration curves were constructed with measuring the potential pairs of electrodes in the concentration range from 10-8 to 10-2mol/l МоО42−. As a result of the measurement were built a graph of E-pC(МоО42−), which was used for the evaluation of the low detection limit (LDL) for ISE. where pC corresponds to the point of intersection of the extrapolated linear regions of the molybdate function graph. In molybdate solutions, pH was kept about 9.0±0.2 using ammonia aqueous solution for better reproducibility. The same pH value was kept also in the interfering ion solutions while studying the selectivity of ISEs developed. where аi is the activity in the main ion solution at the Е potential, М; аj is the activity in the interfering ion solution at the Е potential, М; ziand zj are charges of the main and the interfering ions, respectively. IR spectra of aqueous solutions were recorded of Fourier infrared spectrometer FT 02 InfraLUM (Russian Federation, St.- Peterburg) in wavenumber range 2300–500 cm-1 and treated with application program SpectraLUM (spectral resolution of 1 cm-1). To record the IR spectra using expressive technique . The electrode based on (oxyethyl)nTM5 wt.%, DBF42 wt.%, TFABAHE20 wt.%was employed to determine of molybdate ions of model water samples using the calibration plot method. Lower detection limits and function slopes for molybdate selectiveelectrodes. Figure 2 shows the electrode function of MoO42-–SEs. From Figure 1 is seen that electrodes based on (oxyethyl) nTM have a higher sensitivity (smaller LDL). In Table 3 the results of the study of selectivity are summarized. It is evident (Table 2, Figure 1), that all ISEs developed have near-theoretical electrode function slopes and low LDL decreasing with QAS exchange center steric accessibility improvement, i.e. from TNODA to (oxyethyl)nTM by 1.3 order. If only the series of QASes with improved steric access is considered (from TM to (oxyethyl)4TM), LDL decreases by 0.4 order. The results (Table 3) show that the effect of exchange center steric accessibility of QAS increases from hydrophilic to hydrophobic anions: while switching from TNODA to (oxyethyl)4TM decreases lgKPot(МоО42-, SO42–) only by 0.4 orders, the same change decreases lgKPot(МоО42-, NO3–) by as much as 1.9 orders. The effects observed steric connected with the effect of the exchange center steric accessibility on the molybdate ISE selectivity, can be on qualitatively interpreted by the corresponding change of ion association constants for ions being exchanged: in the model where QAS exists in the form of ion triples with double charged anions and no associates of greater complexity are formed, the ion association constant is described by Eigen-Denison-Ramsey-Fuoss equation [15,22,23]. Selecting the working pH range. It was found that the potentialof МоО42-–SEs little dependent from pH at values higher than 8.5 (Figure 3). To maintain the pH of the solutions was used dilute ammonia solution, but so that they do not exceed the 9.5. High pH values contribute to the accumulation of carbonates, which have a strong influence on the potential of the electrodes and reduce the reproducibility of the results. Lower pH values as unacceptable, since and promote the hydrolytic polycondensation processes in solution. Figure 3 shows the IR spectra of crystalline Na2MoO4·2H2O (Figure 4, spectrum1) and 0.1 mol/l solutions at various pH). For the freshly prepared solutions at a pH greater than 7.5 in the IR spectra (Figure4, spectrum 2, 3) not recorded bands typical for bridged vibrations Mo-O-Mo. Upon standing solutions with pH less than 8.0–8.5 and going recess hydrolytic condensation processes, that significantly affects on IR spectrum (Figure4, spectrum 4–7), in which there are bands of stretching vibrations ν(Mo-O-Mo) about 885 cm-1 and a group of bands around 1030–985 cm-1 attributable to the deformation vibrations δ(Mo-OH) [24,25]. In view of this, when developing of МоO42-–SEs using a freshly prepared solution is stored no more than two days. When this condition is possible to obtain more reproducible results. The МоO42-;–SE based on (oxyethyl)nTM5 wt.%, DBF42 wt.%, TFABAHE20 wt.%was employed to determine of molybdate ions of model water samples using the calibration plot method and the results are given in Table 4. The results indicate that the proposed electrode can be successfully employed for the determination of molybdate in water samples. Nevertheless, as seen in Table 5 our ISE are at the level of earlier described МоO42-–SEs. A new molybdate-selective electrodes based on (oxyethyl) nTM QAS (3,4,5-tris-dodecyloxybenzyl)tetraoxyethyltrimethyl ammonium in chloride form) with the addition in membranes of the solvating additive – 4-trifluoroacetylbenzoic acidheptyl ester. The electrode has been shown to have good operating characteristics (nernstian slope, low detection limit, relatively high selectivity andrelatively fast response time). These characteristics and the typical applications presented in this paper, make the electrode suitable for measuring the molybdate content in water samples. Lur’e Yu Yu. Analytical chemistry of industrial waste water (Russian). Khimia. Moscow.1984; 345 p.
Mohosoev MV. Condition molybdenum and tungstate ions in aqueous solutions. Buryat. knizh. izdat. (Russian). Ulan-Yde. 1977; 458 p.
Sibirkin AA, Zamyatin OA, Churbanov MF. Mutual conversion of isopolycompounds of molybdenum (VI) in aqueous solution.Vestnik Nizhegor. N.I. Lobachevsky. 2008; 5: 45-51. Khodakarami H, Ghourchian HO. PVC-based cerium phosphate membrane exhibiting selectivity for molybdate anions. Iran J. Chem. And Chem. Eng. 2000; 19(2): 51-55. Okaev EB. Synthesis of new highly lipophilic quaternary ammonium salts with regulated steric accessibility of the cation center. Proceedings of the National Academy of Sciences of Belarus. Chemistry Series Vestn. Nats. Akad. Nauk Belarusi, Ser. Khim. Nauk. 2005; 1: 53-57. Kamman K. Working with ion-selective electrodes, Mir (Russian), Moscow. 1980: 510. Dean J.A. Lange´s handbook of chemistry. McGRAW-HILL, INC.1999: 1291. Patent BY (11) 11876 (13) C1(2009). Bazarov TsT, Sarapulova AE, Bazarov BG. Vibrational spectra of ternary molybdates, divalent metals and zirconium. Vestn. Buryat. State. Univ. 2011; 3: 3-7.